Yes, it’s that time of year again – a Philippines Christmas. I thought it would be a good idea to re-blog this post as I’m sure many of you will not have read it before. Enjoy! Merry Christmas! “Maligayang Pasko Sa Inyong Lahat” or Merry Christmas to Everyone! The typical Filipino does not need much of an excuse to celebrate and party. Christmas in the Philippines is no exception. The manifestations of the onset of Christmas start here as early as September. That is when you first notice the street vendors and stalls selling their Christmas lighting and decorations. It is a sight particularly noticeable after dusk when you cannot fail to see the twinkling, flashing lights of reindeers and other Christmas paraphernalia. There is no room here for “bah humbug” type sentiments I used to hear back in the UK – “Oh – I can’t get in the mood for Christmas” type of comment. I suggest if you can’t align yourself with the wonderful Filipino festive mood and traditions then either move or lock yourself indoors for several months! Christmas or “Pasko”, is traditional here in the Philippines for two very good reasons. One being the Spanish influence and the introduction of Catholicism to these islands. Secondly, it is an example of what Filipinos do best of all – look after their family. When you merge the two, then it is no wonder that Christmas is a long season here full of fun, love, the giving of gifts, paying respect to elders, eating and of course celebrating the meaning of Christmas. The Philippines is unique in Asia in that it is a predominantly Christian country. The celebration of Christmas in the Philippines begins on the 16th of December and ends on the first Sunday of January which is the Feast of the Epiphany (The Three Kings). It is quite different from the other countries of the world. It is the longest of the Philippines festivities stretching for over 3 weeks. 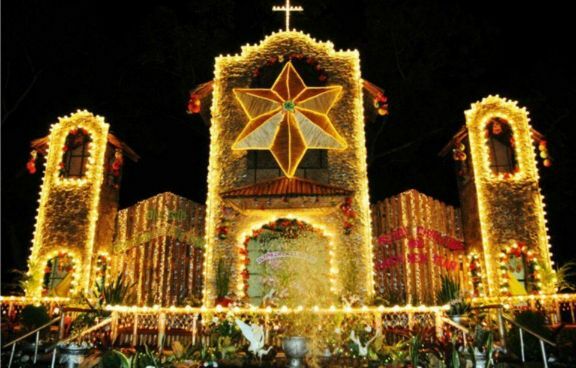 This makes the Filipino Christmas celebration one of the longest Christmas seasons in the world. A rich tradition which, as I say, dates back to the Spanish period. This is also the time of the year when family get together, especially when family members from overseas come home with lots of gifts called “pasalubong.” The exchanging of gifts and the family feast are the highlights of this most loved of celebrations. By around late November or early December you’ll be pleasantly surprised when some children and even adults turn up at your gate singing Christmas Carols. It’s delightful and they are in tune! Give them a few pesos and a hearty, friendly Merry Christmas and all is well with the world. 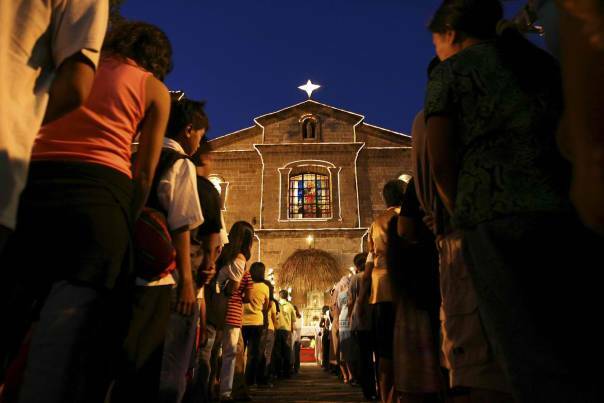 Simbang Gabi, or Night Mass, is a nine day Roman Catholic ritual novena ending on December 24. In fact, it is a devotional series of masses to honor the Blessed Virgin Mary and in anticipation of Christmas. They are held early in the morning between 3 am – 5 am and culminate in the Misa de Gallo, or Roosters mass. As early as November, Filipinos’ houses, offices, and schools, as well as the shopping malls and even streets are adorned with these star-shaped multicolored lanterns. It makes for a colorful spectacle. One of the Filipino traditions during Christmas is the exchange of gifts between families or friends. A simple way of exchanging gifts is bringing a gift to the office or school Christmas party of which the amount is agreed upon by the participants. There are variations on this theme and in offices for example, it is usual for the exchange to take place over three days. The first day is something red, then something green. The third day can be inventive like something sweet and even something gross! (Don’t ask!) This exchanging of gifts is called Kris Kringle or the Monito/Monita. I am informed that there are differences between these two systems of exchange but I fear it was lost on me in translation! This Pinoy system is a modification of the Secret Santa (certain western countries), Kris Kringle or Christkindl (German), Sinter Klass in Dutch, Father Christmas in England and Pere Noel in France. The Noche Buena (literally meaning “Good Night”) in the Philippines is a much-anticipated traditional Christmas Eve feast and eaten after the Midnight Mass when the family return home from mass. 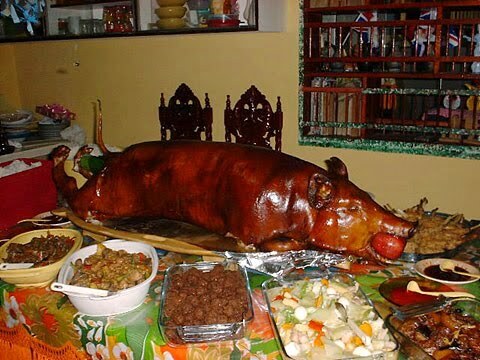 Noche Buena is a very special occasion for Filipinos. They often use their best china and silverware and cook their best family favorite recipe. The most popular dishes are morcon, embutido, relyenong bangus, lumpia, pancit, and for those who can afford it – the lechon or roasted pig. Suman Sa Ibos or Sumang Pasko (glutinous rice wrapped in banana leaves or coconut leaves) served with Halayang Ube and leche flan (egg custard) are the most popular desserts. Noche Buena is a statement of the Filipino Family close ties. It is not only about food; it is a family tradition. Once again, Christmas Day in The Philippines is primarily a family affair. For those who were not able to attend the Midnight Mass, there are masses celebrated during the day and usually in the late afternoon. Most families with young children usually attend this mass. Children wear their new clothes and shoes to go to mass and after the mass, they visit members of the extended family, notably the elders in order to pay their respect. This custom called “Pagmamano” has been an age-old tradition in the Philippines and is accomplished by a child placing the forehead to the elder’s hand and saying, “Mano Po”, a term of respect. The elder then blesses the person who paid respect. “Aguinaldo” is a response by the elder and can be in the form of a gift or money given after the Pagmamano, most usually to the younger children. This is usually a reunion of family members accompanied by yet another special meal. Christmas Day is a time for children to visit their uncles, aunts, godmothers and godfathers. Usually children are presented with a gift, candy, money or toys. Kids love to count their “aguinaldos” as they go about on the Christmas round of visits. Christmas in the Philippines is ultimately about family closeness and kinship and is one more reflection on the importance of family in this country. © Stephen Bentley 2015 No person or entity has permission to use or publish this article any longer since I withdrew my licence to use this article from another online publisher owing to its failure to honor conditions of the licence. Same to you and yours! Merry Christmas!